Plane trips that take half the time, cost half as much and have minimal environmental impact. This is the dream of US based aircraft manufacturer Zunum Aero (Zunum is Mayan for hummingbird). Since 2013, the Boeing HorizonX and JetBlue Technology Ventures backed company has been working on a range of hybrid electric regional aircraft. In this interview, CEO and founder Ashish Kumar speaks to Roland Berger about new developments in the field of electric propulsion and the vision to eliminate all short-haul emissions by 2040. By 2030, Zunum Aero plans to build hybrid to electric aircraft capable of flying more than 1000 miles. What is Zunum's development path? All our focus is on the 6 to 12 seat, 700-mile aircraft we are developing for entry to service in 2022. 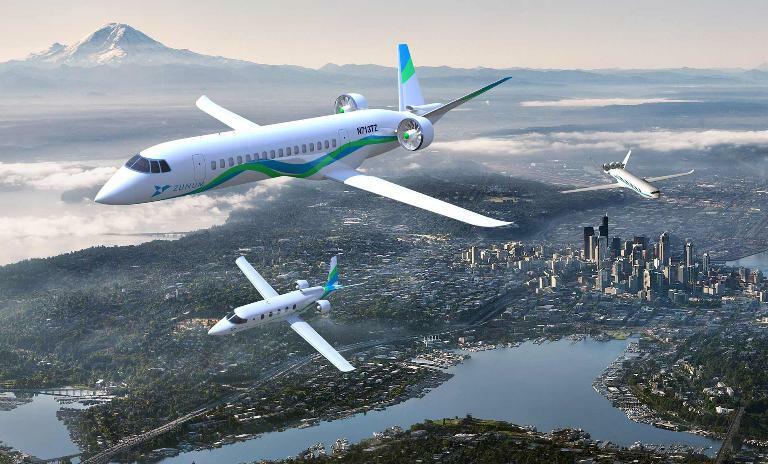 This will kick-off the commercial electric era with breakthrough economics, 8c per seat-mile, and door-to-door times half that of commercial air today. However, we have architected the underlying technologies for extensibility to larger platforms and longer ranges. Our roadmap is to scale from this 1 MW aircraft to roughly 4 MW on a 50-seat 1,000-mile aircraft in the mid-2020s. And then to 17 MW on a 100-seat 1,500 mile aircraft (Mach 0.7) in around 2030. Each of these platforms offer disruptive economics relative to the fleet today, together with quiet and short runway capabilities for fast door-to-door travel through nearly 40,000 airfields worldwide, relieving congestion at the hubs. Crucially, this roadmap would place aviation on path to eliminate all short-haul emissions by 2040, equating to 50% of all emissions from the sector, aligned with the goal set by Norway. "Crucially, this roadmap would place aviation on path to eliminate all short-haul emissions by 2040, equating to 50% of all emissions from the sector. " How is Zunum working with regulators? Our work with regulators dates to early 2014 when we were one of four or five initial members of the FAA/ASTM Electric Aircraft Working Group, developing regulation for electric aviation under FAA Part 23, applicable to aircraft under 19 seats. This was a direct outcome of the 2013 SARA (Small Airplane Revitalization Act) of U.S. Congress that drove a rewrite of Part 23 to reduce the time and cost of certification by 50%, while shifting regulation to an industry consensus standard. Because of this effort by the FAA and proactive manufacturers, a full suite of standards will be in place later this year, paving the way for electric flight. We expect the time to market for Part 23 aircraft programs to improve on the 3 to 5 years historically, but the new standard is yet to be tested. We are also increasingly engaged with legislators around the world on policies to support electric aviation. Much of our planet suffers from a transport gap over regional ranges with long stagnant mobility, communities increasingly disconnected from the global air system as commercial air consolidates to a shrinking set of large hubs. Moreover, given strong growth of medium to long-haul the sector has no clear path to its stated goal of reducing greenhouse gas emissions by 50% in 2050 over 2005 levels. We have been engaged with Norway over the past year, making good progress at the State-level in the US, and seeing increasing interest across Asia and the Southern hemisphere. How is Zunum organizing itself to meet its commitment to JetSuite to deliver 100 aircraft? We are excited to partner with JetSuite for our launch. The innovative JetSuiteX service whisks travelers city to city, avoiding hubs and queues, to offer a business jet-like experience at fares that approach commercial. Building on roots in California, JetSuite is now scaling this service nationwide. We expect this form of fast, convenient travel to become universal in the 2020s, boosted by the disruptive economics of our hybrid-to-electric aircraft, helped along by improving autonomy, biometrics and intermodal connectivity. We are on track to production commitments and focused on reducing risks on our “conservatively aggressive” schedule. Our approach is three-fold. First and most critically, our baseline technology is highly de-risked, combining TRL-9 aviation technologies with best-in-class ground EV battery modules. The hybrid-to-electric powertrain is well suited to rapid prototyping on 12-month cycles, enabling us to mature the technology ahead of introduction. Meanwhile, our architecture enables choice of all-electric or hybrid variants, and the ability to transition the hybrids to all-electric based on development of battery technologies. Second, we are very fortunate to have attracted a deep pool of seasoned engineers with highly relevant experiences. Our early focus was on Electric power and Propulsion. More recently, we have expanded to key aircraft disciplines, drawing talent from Pilatus, Embraer, Gulfstream, Honda Jet, Bombardier. We are also engaged with Boeing in several areas and benefit hugely from their leadership of the sector. Third, we are actively engaged with the aviation supply chain on many aspects of our program and expect to make several announcements later this year that will define our partnerships. To better understand the field of electrical propulsion, we have conducted a number of additional interviews with aerospace incumbents, startups, academic institutions and public-private partnerships. Over the coming weeks we will be publishing several of these interviews online, and key takeaways from our industry analyses – as well as a full update of our Think:Act publication on the topic. How will the industry evolve due to electric propulsion? How will electric propulsion impact your company? We invite you to contact us at EP@rolandberger.com , or connect with Robert Thomson or Nikhil Sachdeva via LinkedIn to discuss your thoughts.